I’ve just learned that Blender has a wonderfully helpful function called Local View. This will isolate a selection, zoom in on it, and hide all other items in the scene. Using Local View again will bring back all items as they were seen before. Thanks to Darrin Lile for this tip! We can execute Local View with the default keyboard shortcut “Numpad /” (the division operator on your numpad) – but of course that only works if you have a numpad. On my Windows system I have one, but sadly on my Mac and my laptop I do not. In this article I’ll show you how to map this shortcut to another key. Let’s get started! Head over to File – User Preferences – Input. It’s a scary window with lots of options, I know. 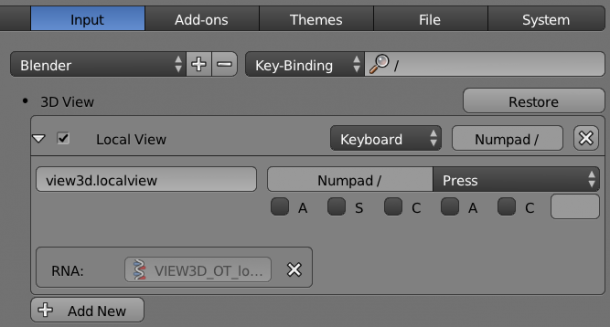 Here we have access to every function that is key-mappable in Blender. To whittle out options down a bit, find the filter menu at the top right of this window (it has a Name dropdown, with a search field next to it). Switch Name to Key-Binding. This will let us look up a keyboard shortcut. Type a “forward-slash” into the search field, and you’ll see the Local View function appear. Click on the little white triangle to open the options. See where it reads view3d.localview? Just to the right of it there’s a field with the current keyboard shortcut (i.e. Numpad /). To change this, simply click into this field, and press a button of your choice. It’s that easy. In my case, I’d like to map the standard slash at the bottom of my regular keyboard to this (it’s the one next to my right shift key). This key isn’t used by any other shortcut as far as I can tell, but feel free to use any key of your choice. When you’re done, hit Save User Settings at the bottom of the window, so that Blender remembers your choice next time you start it. Note that using Local View will temporarily change the 3D cursor to the selected object. This can be helpful in certain situations, but it may not be what you want in others. If you just want to put the selected object or selection into the middle of the viewport, look into the Show Active function. This will not touch the 3D cursor. The default keyboard shortcut for Show Active is the period key. On a side note, I’d love to be able to change the zoom rate of this function. I have no idea how to do that – but if I find out, I’ll post it here. In the meantime, perhaps someone over at the Blender Stack Exchange has the answer.